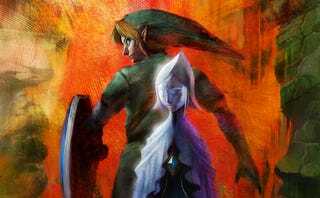 If you're a Zelda fan you're going to want to sit down before reading this. We've got an amazing prize pack to give away to the biggest Kotaku Zelda fan: A copy of The Legend of Zelda: Spirit Tracks, a Spirit Tracks t-shirt, a $1,000 Nintendo World Store gift card, a Zelda's "biggest fan" trophy and a white Nintendo DSi system personally signed by longtime Zelda producer Eiji Aonuma. But proving that you're a big, huge fan of a Zelda is old hat. We'd ask and you'd deliver with amazing, inspired photos of yourself posing, showing off items, doing silly stunts. But that's been done to death. Recruiting others to your cause, now that shows true dedication. Here's what we want to see from you: Photo or video proof that you've convinced friends, congregations, schools, entire stadiums of people that the Zelda franchise is the best around. In the video or photo your converts will need to each be holding a Kotaku sign so we know it is legit and for this contest. You''ll also want the video or photo to somehow demonstrate your love and their new-found love of the Zelda games. The entire team at Kotaku Tower will be going through your entries to pick the best, judging each based on quantity and quality of converts and the zeal with which they and you seem to be enthralled with Zelda. Once we've selected the 11 finalists we'll let you vote to determine the winner. While the grand prize winner will be walking away with those unbelievable prizes described above, ten runners-up will each receive The Legend of Zelda: Spirit Tracks game and a Legend of Zelda: Spirit Tracks t-shirt. * One entry per an account only and pictures missing the Kotaku sign (everyone in it needs to have one in some form) will be tossed out. *Contest only open to residents of the Americas. *You must include your submission as a comment in the post linked here, but not as a reply to this story. *We will be regularly checking to make sure new users submitting for the contest have their accounts activated as quickly as possible, but it might take a day or two to show up on the site. *Do not email your entry, these will be ignored. They have to be submitted in comments HERE, click on this link. Please only use that post for your entries, not for commenting or discussing so we can more easily sort through the entries. *Read the rest of our standard rules here. *CONTEST DEADLINE: All entries must be posted no later than December 31.